Due to my full teaching load at the the University of Louisville, I am unfortunately unable to take any regular private students outside of my jazz bass studio at the university due to time constraints. Exceptions to this general rule can be made for students who are considering applying to the jazz studies program at UofL, and certainly for anyone looking for help preparing their audition. If you don’t fall into either of these categories but are still looking for private jazz instruction for double bass in the Louisville area, feel free to contact me via email and I will do my best to help you find the right teacher for your needs. 1) Teach students the basics in terms of jazz technique, concept and repertoire that will allow them to function in ensembles, play basic jazz gigs, and complete the requirements of the program. 2) Help students develop their own individual voice on the instrument, no matter what type or genre of music they intend to apply it to. This involves personalized technical study, instruction in various styles, and generally moving beyond the basics outlined in part 1 above. More importantly, though, this step really involves helping teach students to be good autodidacts; put another way, my real intent in this phase of study is to help teach each student how to think for themselves, and to solve musical, technical, and stylistic issues by careful analysis and examination of both the problem itself, and of the “self” attempting to solve the problem. In the end, my best teachers were those who didn’t give me a fish so that I wouldn’t go hungry that day, but rather those who taught me the art of fishing so that with a little effort and determination I need never go hungry again. In this phase of study, I do the best I can to emulate my best teachers in this regard. Some students never get far beyond step 1 as described above. There may be many reasons for this, but most commonly such a student may be focusing their energy on some other aspect of their musical or general education (students who are double majoring often find themselves in this situation). This is a choice, and as long as the student makes it openly and honestly and owns their decision, I do not question it often (I may, however, check in from time to time on the subject to make sure they are getting all they want out of their bass studies!). Other students are voracious in their appetite to master the art of bass playing and wish to get to step 2 as quickly as possible. These students carefully line up the requirements for each semester and fulfill them as early as possible so that they can focus the majority of their studies on step 2; this is also a choice, and I never question it as long as the basic requirements are fulfilled. In fact, those lessons where a student who has completely completed their semester requirements (and prepared for their playing exam) comes in with a topic to explore and a specific musical problem to address are my favorite form of teaching. For the basic method that I use in approaching most repertoire, please see this document: Bass Study Method (Repertoire and Improv) This page is the last page of every applied jazz bass syllabus, no matter what the level. This method (or parts of it, depending on the circumstance) is the exact same method I use to learn repertoire and hone my skills. For a basic list of what is considered “Standard Repertoire”, see this list: Repertoire List for Bass Study This page, while not exhaustive, represents a good place to start to choose tunes that are commonly known by many professional jazz musicians. Bass students who majoring in Jazz Studies at UofL also have the opportunity to take 4 semesters of secondary lessons. Most students choose to take these lessons in the area of applied classical bass, and to study with my colleague, great friend, and master bassist Sidney King. Sid keeps a large studio of classical performance majors but is always open to teaching secondary lessons to jazz studies majors who are looking to expand their horizons and fortify their technique by studying traditional repertoire with the bow. 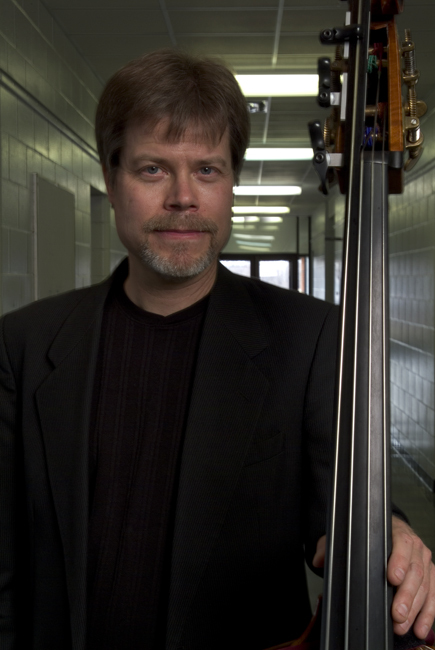 Sid is a devoted and caring teacher who puts an incredible amount of energy and expertise into his teaching, and I strongly encourage all jazz bass students to avail themselves of his knowledge and input. Every single person who has done this has come through the experience a much stronger and better informed bassist. To this I can only add that Sid has been a great bass mentor to me as well, especially in my earlier years of playing when I was still forming many of the left hand techniques that I now espouse as a teacher. If you are interested in studying privately with me at UofL, or have any questions about the program, please do not hesitate to send me an email. If I can’t answer your question, I’ll direct you to someone who can.